CROOKED JADES / New Album Tour May 17-20! Super Exciting!! 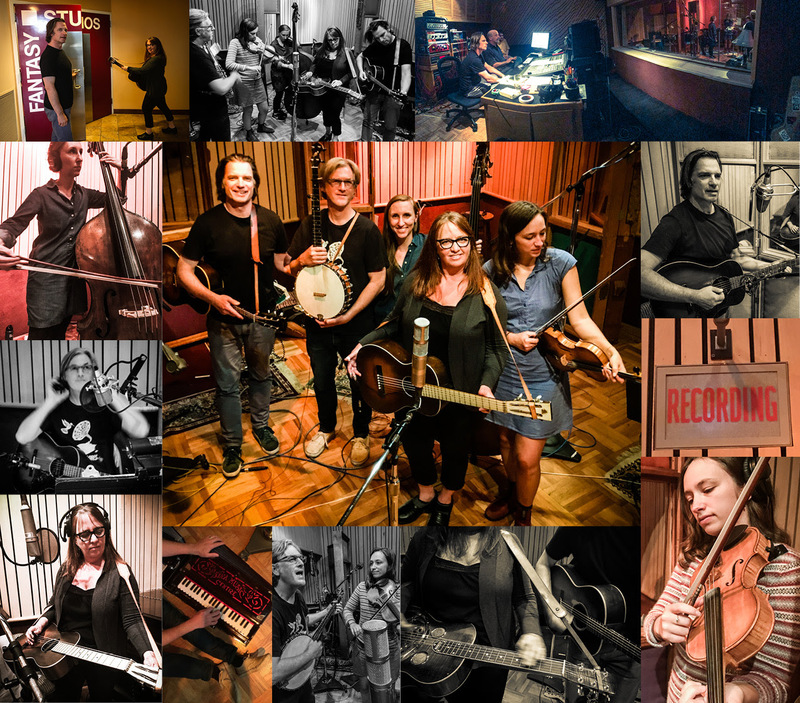 The Crooked Jades have been working their music alchemy in the studio, completing their 9th album, “Empathy Moves the Water.” We’re about to head out on our CALIFORNIA TOUR, including our San Francisco hometown show at the Great American Music Hall! And we are thrilled to have Megan Adie, our beloved bass player, coming in all the way from Sweden! Come on down! The band’s following have been clamoring for a new album, and one fan in particular, who wants to remain anonymous, is helping to make this possible. 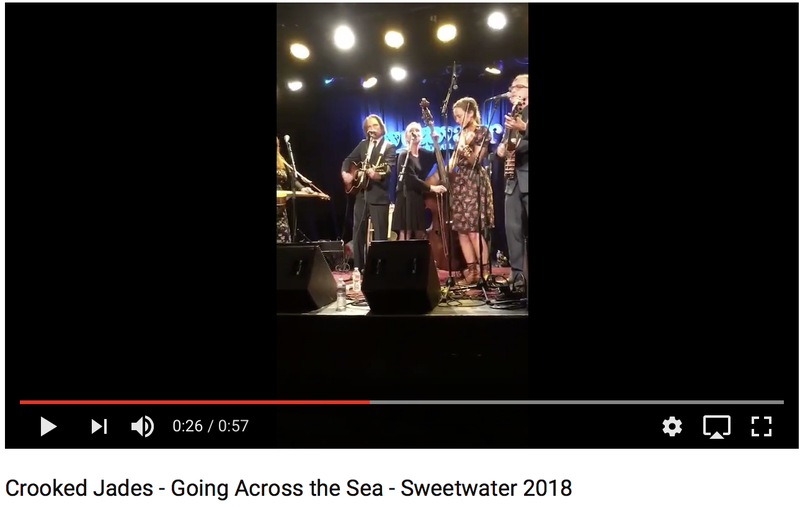 He was so impressed with the Crooked Jades’ performance at the California Bluegrass Association Father’s Day Bluegrass Festival in 2017, that he became a benefactor to financially sponsor the new recordings with the band’s present configuration. We thank you! All day event starting at 10am. Free parking at Pomona College parking structure. Featuring art & music workshops for all ages, vendors village, local food & libations! More info at link above. PLUS! Dance Barn with our pals Skillet Licorice, Ira Bernstein and more. All day event with 4 Stages, Contests, Vendors, Food, Arts & Crafts and more. Info at link above. Across the wide seas, distant mountains, and the vast complexity of the soul, The Crooked Jades new release “Empathy Moves The Water” emphasizes the lonesome in “High Lonesome” music. The band’s old-time roots reflect the cultural melange and longing implicit in the shadows of America – from haunting ballads punctuated by hypnotic fiddles that express digital isolation and humanity lost in a rapidly changing land, to the high energy revival songs inspired by early rural gospel blues. Reaffirming their reputation as an innovative old-time string band closer in spirit to Tom Waits and Nick Cave, The Crooked Jades create a unique and soulful modern sound by exploring the roots of Americana and interweaving the diverse musical influences of Europe and Africa. 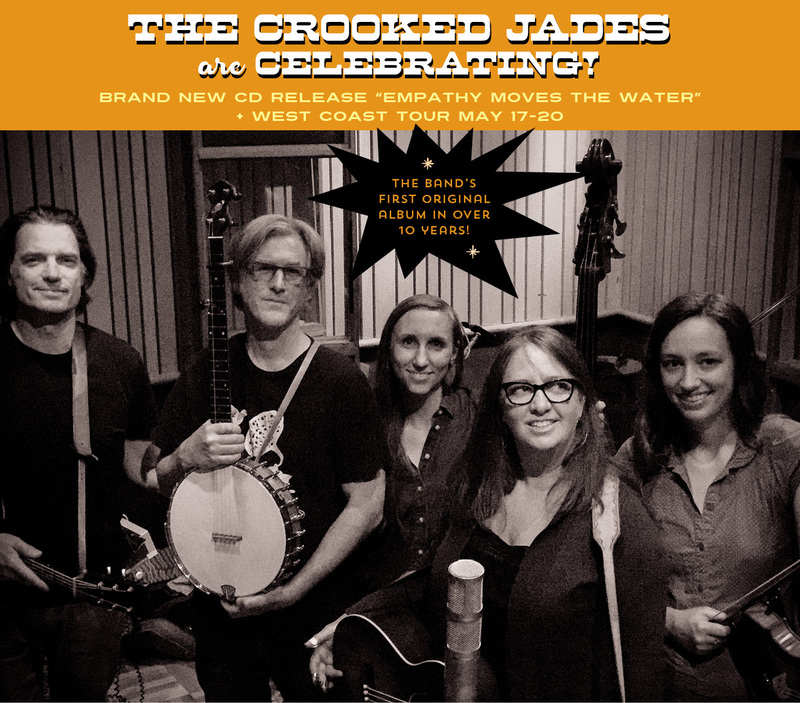 With a bold vision and drive to innovate and inspire, the Crooked Jades release their brand new album “Empathy Moves The Water” on their own label, Jade Note Music. Largely recorded at Berkeley’s famous Fantasy Studios, this new album is produced by the highly celebrated Bruce Kaphan. The band once again features their signature mix of inspired re-arrangements of rare and obscure old-time gems and beautiful original compositions, played on vintage and eclectic instruments, including Hawaiian slide, Vietnamese jaw harp, harmonium, ukulele, banjo, ukulele, arco bass, and minstrel banjo. The Crooked Jades continue their mission to move old-time music out of segregation and show its relevance in modern times. Their evocative, cinematic music has appeared in soundtracks for Sean Penn’s Oscar-nominated film Into The Wild and the PBS documentary Seven Sisters: A Kentucky Portrait. Known for their rare and obscure repertoire, inspired arrangements and eclectic, often vintage instrumentation, The Crooked Jades began with band leader/founder Jeff Kazor’s vision to revive the dark and hypnotic sounds of pre-radio music. Their new music continues their mission to re-imagine old-time music for a modern age, pushing boundaries and blurring categories with their fiery, soulful performances. Building on an old-time foundation, the band filters old-world sounds with universal and ancient themes through a post-9/11 lens, seeking to make sense of the future, reaffirming the importance of connecting to our roots in a time of intense digital connection. Writes Bluegrass Unlimited, “Chords in unexpected places, out of this world harmonies, and some of the most powerfully-arranged material I’ve ever encountered.” Innovative and fearless, constantly evolving and passionate, they bring their driving dance tunes and haunting ballads to rock clubs, festivals, traditional folk venues and concert halls across America and Europe. 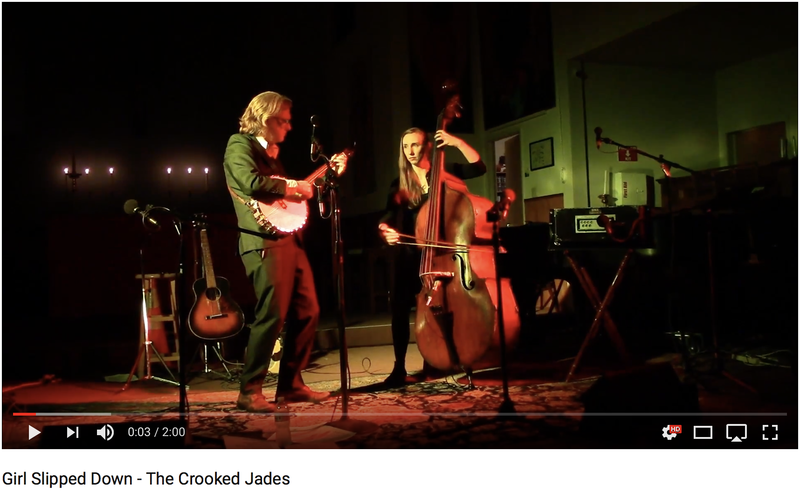 The Crooked Jades core consists of founders Jeff Kazor (vocals/guitar/ukulele) and Lisa Berman (vocals/slide guitar/banjo/harmonium), with long-time member Erik Pearson (vocals/banjos/ukulele/harmonium/slide guitar), and the invaluable Megan Adie (vocals/bass) and Emily Mann (vocals/fiddle). This current line-up builds on 20+ years of The Crooked Jades performances and recordings. The band has traveled countless miles across 4 continents, 10 countries, and many festivals, resulting in 8 critically acclaimed albums.